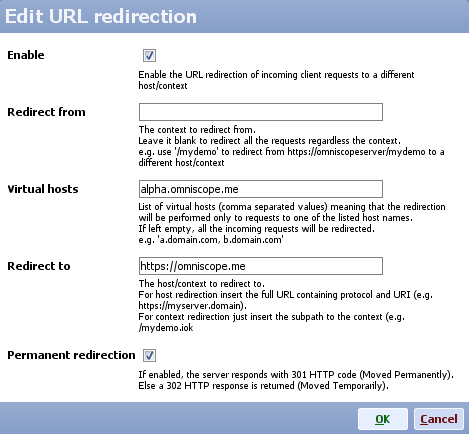 Omniscope Mobile Web Server allows you to configure both HTTPS and URL redirection. This technique allows you to make a web address/context available under more than one URL address. For instance, the following configuration allows to redirect the client, that was navigating to "alpha.omniscope.me", to the different "https://omniscope.me" host. e.g. it redirects from "http://alpha.omniscope.me/folder/file.iok" to "https://omniscope.me/folder/file.iok"
Say that your server is serving at "http://server.domain" and you want to redirect "http://server.domain/dashboard" to the full link "http://server.domain/MyDefinitelyBeautifulDashboard.iok". The following configuration allow you to do so. e.g. 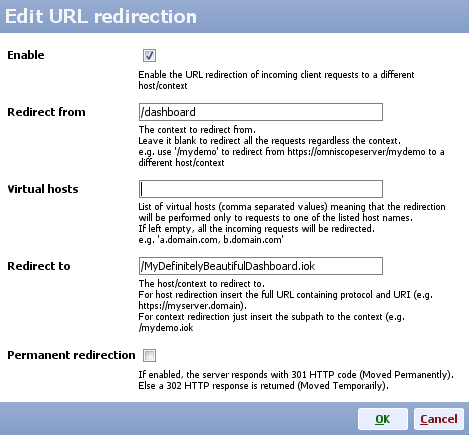 it redirects from "http://server.domain/dashboard" to "http://server.domain/MyDefinitelyBeautifulDashboard.iok"
This example combines host and context redirection. It will redirect from "http://alpha.omniscope.me/demo" to "https://demoserver/MyBeautifulDashboard.iok". To redirect all incoming requests to a particular context regardless your server host/virtualhost name, then leave the VirtualHosts field empty. N.B. by specifying the Redirect from field you define which context has to be redirected. Be aware that misconfiguration may create redirect loop error. 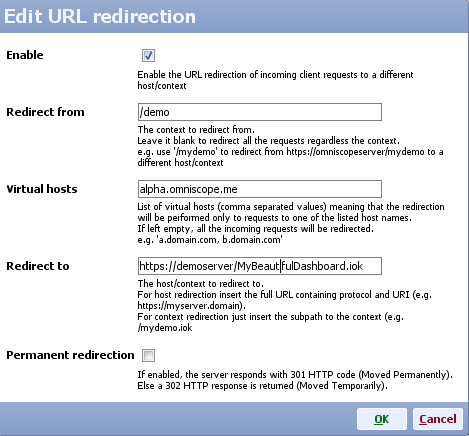 Redirect HTTP to HTTPS: redirects all incoming HTTP requests to HTTPS. If the HTTPS protocol is enabled, this option will configure your server to serve the content only through the HTTPS secured channel. In the above, you can comma separate a number of virtual hosts, however these would all go to a single configured redirect. Current configuration allows multiple vhosts to one location. Can this be added, as there appears to be no way to achieve this in the configuration. Andrew - as discussed via e-mail, this problem can probably best be solved using by using a proxy. If enough clients need one, we may be able to add a proxy service to the Web Server or Admin Web Server bundled in Omniscope Server Editions. Feel free to post the idea of us adding an internal proxy to manage all this type of re-direct and link obfuscation/clear text link guessing security issues as an Idea.